Shrimp, Tofu, and Bamboo Shoot...you can't go wrong with the combination. Here's another variation of the filling for steamed dumplings. With the filling, this time I did gyoza-style and mushroom shumai style. I had a few friends came over and we enjoyed both on the tabletop. 1. Mix the ingredients for the filling in a bowl until smooth by hand. Cover and refrigerate for 30 minutes. 2. For the gyoza-style, wrap the mixture in gyoza wrappers and set aside. 3. 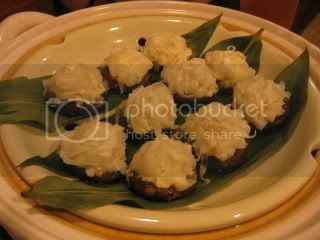 For the mushroom shumai-style, dust the inner side of each shiitake mushroom with potato starch by using a small strainer. 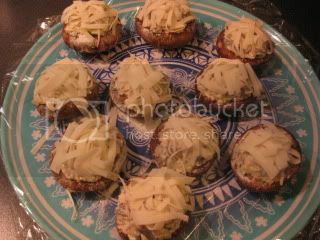 Fill each mushroom with an optimal amount of the filling. 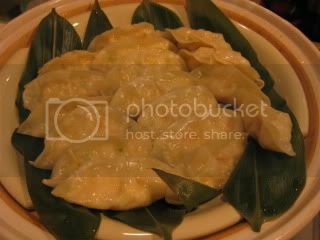 Toss the thinly-sliced wonton skins and top each dumpling with a small amount of the wonton skins. 4. Get the donabe steamer, "Mushi Nabe"ready. For the gyoza-style, set the dumplings on the grate. Cover and steam for about 5 minutes or until they are cooked through. For the shumai-style, the cooking time is about 7-8 minutes or longer, depending on the thickness of the dumplings. 3. Serve with ponzu or your choice of dipping sauce. *In order to prevent the dumplings from sticking, I suggest that you line the steam grate with parchment paper (with small holes), some napa cabbage, or bamboo leaves like you see in the picture.